Nabbed some cheap flights? Bashing your way through the Baltics? Only have a few days and need to get the most out of every second? We’ve got you covered! 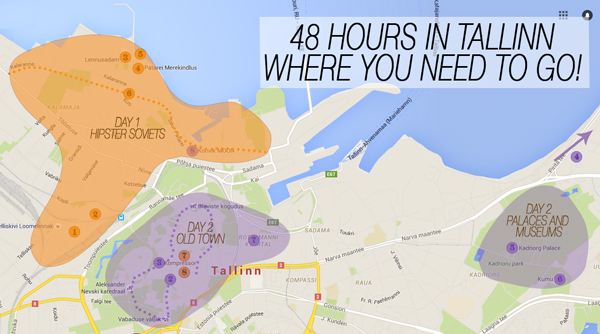 This guide for what to do with 48 hours in Tallinn will make sure you don’t miss a beat. It’s a city that feels more like a strange cousin of its Scandinavian neighbours than any figure of its dark Soviet past. 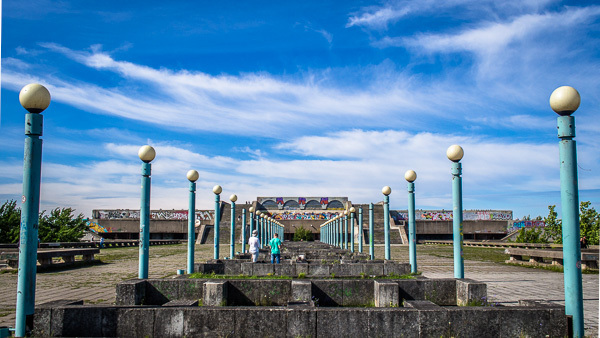 It’s happy to show off its nerdy side and embrace a medieval culture with its beautifully restored old town, but just a few steps outside the city walls you’ll be invited into a completely different realm of hipsters, soviet relics and innovative new buildings. Get up early and head straight for the hipster district Kalamaja. You won’t find many tourists here compared to the old town and it’s a great place to start your Tallinn adventure. Lots of good cafes to buy some breakfast or a good coffee to start the day. Wander around and check out all of the cool street art on your way to the Russian market around the corner. The market is a good place to pick up some cheap food for the day or just gaze at all the strange things on offer. Once you’ve filled your pack with Soviet era nick-nacks, head to the Seaplane Harbour. You can then either head inside the submarine museum (we didn’t) or just walk around the grounds and check out a great view of the Baltic Sea (we did). Patarei Prison is the next stop of the tour and it’s just next. It’s one of the strangest, weirdest and scariest “museums” we’ve ever been to. 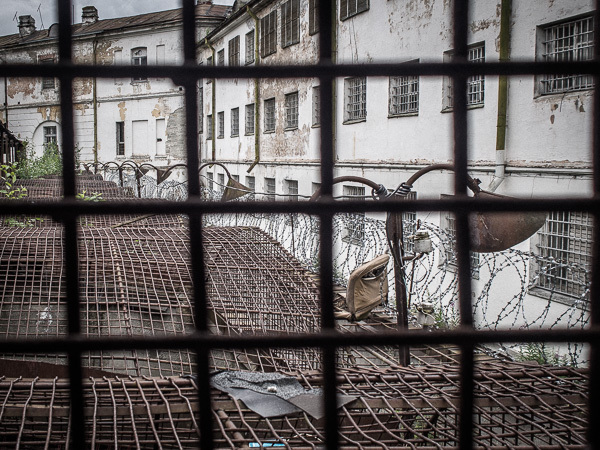 This abandoned prison has tours or you can self-guide yourself through this ex soviet prison. Easily the best thing to see or do in Tallinn. Have a beer, decompress and take in everything you’ve just seen at the beach bar in front of the prison. Put your walking shoes back on and walk the cultural kilometer trail to see more of Tallinn’s soviet past mixed with youthful new blood. There are abandoned factories, design studios, cafes, a contemporary art museum, and you’ll finish the walk at what I like to call the big Soviet turtle (it officially goes by the name of Linnahall). For the last bit of sightseeing of the day head back to the old town, wander the streets, chat with all the dressed-up jesters, maids and wenches in the many medieval-themed restaurants. 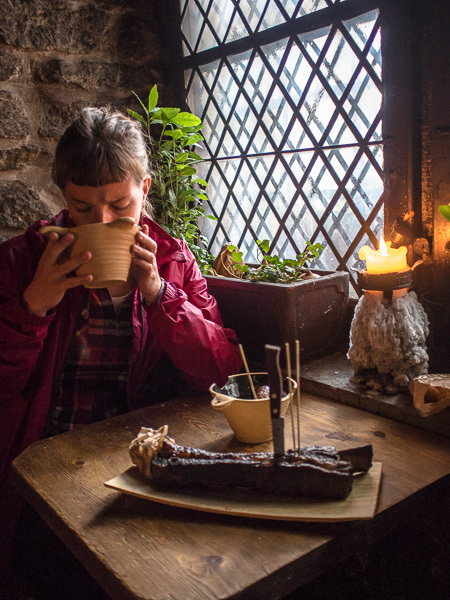 If you want a good laugh and get on board the medieval train, have a bite to eat at 3 Dragons. It’s the smallest of the medieval restaurants and it’s right under the church. Some of the things you might see on the menu include elk pie or soup, wild boar sausage and ox ribs! 9. Beer, Beers & Beers! You’re probably going to have a little hangover, so have the morning off. 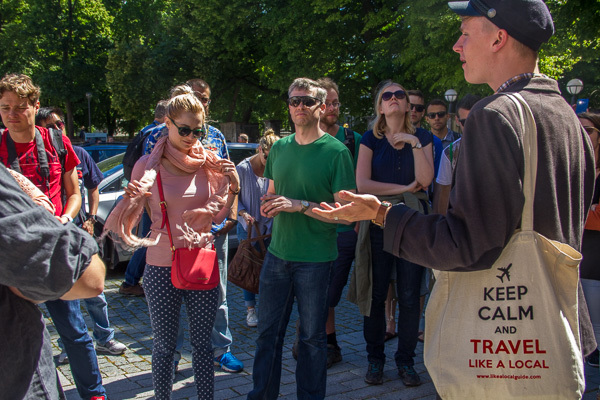 Time to get the old history of Tallinn into you with the free walking tour at 12 which focuses on the old town. You’ll learn lots of fun facts and understand a bit more about all the old buildings over this 3 hour tour. One of the best free tours we’ve taken in Europe. Either before or after the tour head to Kompressor, the legendary pancake house, for breakfast or lunch. BIG pancakes stuffed with all sorts of things and cheap as chips. If it’s a nice day and you don’t like museums and palaces, head to Pirita Beach and relax. 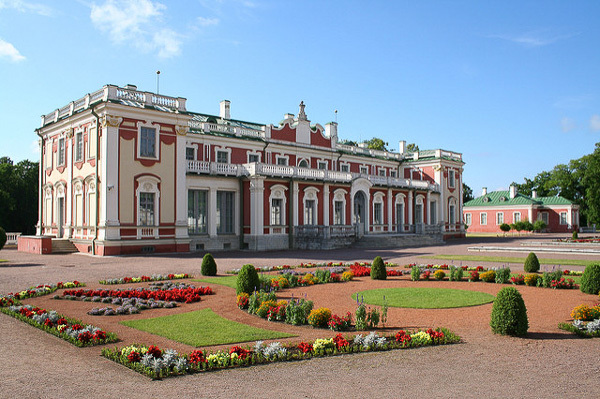 Otherwise, jump on a tram to see the Kadriorg Palace, its gardens (built by Russian tsar Peter the Great) and Vabariigi Presidendi Kantselei (presidential digs). When you’re done looking at the fancy buildings and trees you can head inside the Kadriorg Art Museum and Kumu Art Gallery. When you’ve had your fill of museums start heading back to old town via the Rotermann Quarter. Like Kalamaja, this district used to be filled with old factories but is now full of cool shopping, restaurants and bars. If you can’t decide on a place to eat you should try Moon for dinner. Cheapish, good and one of Tallinn’s best restaurants. Pat yourself on the back for a weekend well done! 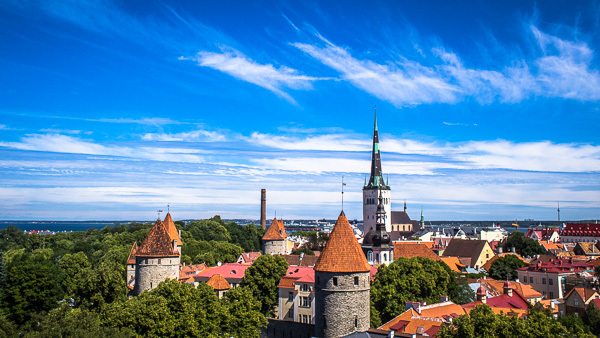 Isn’t Tallinn beautiful from up here? There are plenty of hostels in town with Monks Bunks or the Red Emperor Hostel the pick of the bunch. Both are a bit more in the party vein, but very social and good fun. The Red Emperor is also one of the city’s best alternative bars that locals frequent. If you don’t want to deal with a busy party hostel, Airbnb has many options in town as well. Tallinn is very small so you can walk to almost everything. The palace is the furthest thing away at 3 km and you might need a tram. If you’re not into the walking thing then your best bet is a 72 hour transport card for 5 Euros. Tallinn’s airport is close to the city with an easy bus connection to the old town. The cheapest and easiest option by far. If you book online a few days ahead you can get tickets to Riga for just 5 Euros! Simple Express or Super Bus are normally the cheapest option. To Riga: Not a very good option between these cities. It takes longer than the bus and it’s more expensive. You’ll also have to switch trains and possibly have a long layover. To Russia: You can get trains to Moscow or St. Petersburg. Make sure you have your visa in order though as its’s not the easiest thing in the world to get. Tallinn has many options for getting around by sea. Excellent way to get over to Scandinavia (Stockholm & Helsinki) or for a 72 hour tourist visa for Russia (St. Petersburg)! Don’t bother with the Occupation Museum. It’s not very well presented with bulk text and no other media. There is a better one in Riga that is well worth the money. Old town is very touristy and is okay for a look around, but prices are 2 times higher within the walls.